The most important aspect of an awareness campaign is obviously publicity, without publicity a campaign like this one would be worthless, as I wouldn’t get my message across. The media attention was altogether very good. I would like to thank all the members of the media, who supported the project by covering it. On this page you see some of the newspapers articles and you get a picture of most of the radio stations who supported me in one way or another. I’m well aware that there were many more members of the media. 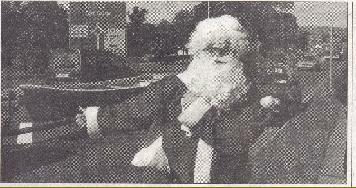 SANTA was spotted in Carlow during the whirlwind tour of the county. Sweating profusely through his thick costume he was thumbing his way to Wexford when The Nationalist caught up with him. It was originally believed he was on one of his fact finding missions making sure all the kids were behaving themselves but this Santa was on a different crusade. “I was trying to travel 1,000 miles in seven days around Ireland promoting suicide and depression awareness,” said Wolfgang Lolies, from Midleton in Cork. “My brother-in-law, Michael O’Carroll, killed himself some time ago and I decided to create some awareness about the problem. I started Thursday week agobut it’s taken me more time than I thought it would to get done. “I’m getting a lot of smiles and beeps but most people don’t realise I’m actually thumbing and forget to pick me up. I climbed Croagh Patrick last Sunday. It was really tough and it took four hours but I made it. Mr Lolies aka Santa was on the last leg of his journey when we met him. By the time he got home he had travelled through Cork, Killarney, Limerick, Tipperary, Waterford, Athlone, Westport, Sligo, Dublin, Galway, Lisdoonvarna, Carlow, Wexford and Midleton. A tour guide by day, this is the second time he has taken a trip around the country. Last year he hiked the country in a wheelchair to create awareness for disabilities. “Inever take any money for it because it’s not a fundraising stunt. If you want to donate anything give it to AWARE or any of the other organisations. 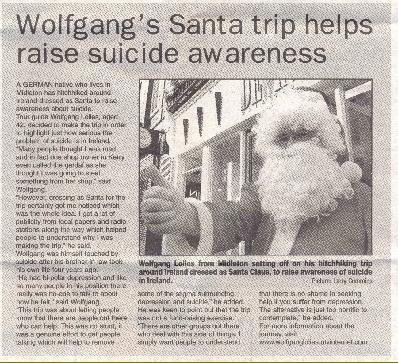 It isn’t often you associate Santa Claus with the very serious subject of suicide. But a Corkman has decided to go on a 1000 mile walk to highlight a subject that dare not speak its name. Wolfgang Lolies has been hitching from Middletown to Sligo for the past five days in this unseasonal garb to make people aware of the illness that claimed 444 lives last year. He has been taking lifts along the way and yesterday climbed Croagh Patrick before speaking to the Weekender. His roundabout trip is expected to last for another week. The 41 year-old’s brother-in-law’s tragic death two years ago prompted him to do something to about the dreaded topic which causes so much misery. “I am not fund-raising but just trying to make people aware that it is a big problem. “I know that professional and voluntary bodies help a lot but this my own personal way of making people aware. “444 people took their lives in this country last year and 293 were killed on the roads and we talk about road carnage. “I don’t have the answers but hopefully by dressing up in this garb and talking to people. I will get people talking and that is a small beginning. “In no way am I trivialising this great scourge in this country but hopefully people will understand why I feel so strongly about it. “My brother-in-law was suffering from a bi-polar illness and took his life a few years ago. “I don’t know if medication is the complete answer but people should above all learn to talk about it. “A number of local media have been in touch with me so they are helping me to highlight this delicate issue. Wolfgang has another 500 miles to go before he returns to his day job as a tour guide in county Cork. So if you see Santa Claus in your town, don’t laugh because he is reminding us of a very serious subject. A GERMAN man living in Midleton is hitch-hiking around Ireland to raise awareness about suicide. Wolfgang Lolies, a 41-year old tour guide, is dressing as Santa Claus for the 1,000 mile trek, which began this morning. He was touched by suicide after his brother-in-law took his own life four years ago. “When it happens so close to home you realise just what a devastating effect it can have on those left behind,” said Wolfgang. He said that the trek around Ireland was about letting people know how serious the problem of suicide was in Ireland. “Last year alone 444 people in Ireland took their own lives and yet very little is being done to remedy this shocking statistic,” said Wolfgang. “Similarly, there were 293 road deaths, which were given much more publicity. By doing this I hope to make people aware that more needs to be done to help prevent people taking their own lives,” he added. The reason he is dressing as Santa Claus is to point out that Christmas is one of the times people feel most vulnerable. “Also it will make people sit up and take notice. After all it is not too often that Santa makes an appearance in the middle of July. People will ask why I am doing this which will be one way of opening some sort of dialogue about the whole issue,” added Wolfgang. The seven-day trip will see him travel through Cork, Limerick, Sligo, Dublin and Kilkenny. Wolfgang was keen to point out that it was not a fund-raising exercise.